Help in designing the 2+2 car with a twin-cylinder two-stroke engine sited behind the rear seat came from Schorsch Meier, a famous pre-and post war driver, who was an acquaintance of Glas. 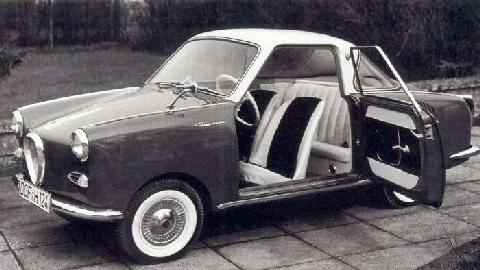 The first Goggomobil was introduced in the spring of 1955. The initial 5,000 Goggomobils were more rudimentary in their construction than subsequent cars. Because the company did not have the money at first for the necessary presses, the early wings were screwed on to the body. Subsequently they were formed as one unit with the body. The small car was a staggering success and ten months after the launch the ten thousandth car was delivered. The first cars were of the T 250 type. This four-seater was powered by a 247 cc twin cylinder engine mounted in the rear that produced 13.5 bhp at 5,400 rpm.